Wage growth: New year, new me? December’s headline inflation brought an upside surprise, but given that this was mainly down to seasonal factors (which helped offset the decline in gasoline prices), it is unlikely we'll see a repeat in January’s data. Instead, we expect the downward trend in headline inflation to resume as weak energy prices continue to feed through. We should see the annual figure come down to 1.6% from 2.0% in December. Despite a better start to 2019 for crude (Brent rose from 54 to 61 USD/bbl between December and January), oil prices tend to translate into gasoline costs with a one-month lag. That means the late-2018 oil price plunge is still working its way through. You can see from the chart below that, on an annual basis, average gasoline prices are falling increasingly rapidly. For the Bank of Canada though, the focus is on the core measures of inflation, which have stayed stable at 1.9% on average even though wage growth was persistently weak through 2019, which you might have expected to have begun weighing on core inflation itself. That said, these reasons for caution have diminished a little since the start of the year, following a welcome pick-up in average hourly wages for full-time workers. After seven months of consistent declines, the figure shifted up from its recent lows of 1.5% YoY to 1.8% in January. But we aren’t getting our hopes up too soon just and will be closely watching the next employment report due 8 March. Having said that, there are some reasons for optimism, with business surveys suggesting firms view labour availability as an increasing constraint on production, which would point to further upside in wage growth over the coming months. That doesn’t mean core inflation isn’t under pressure from other downside factors. An environment of higher rates and a shaky housing market could knock the so-far-resistant household activity off its pedestal. 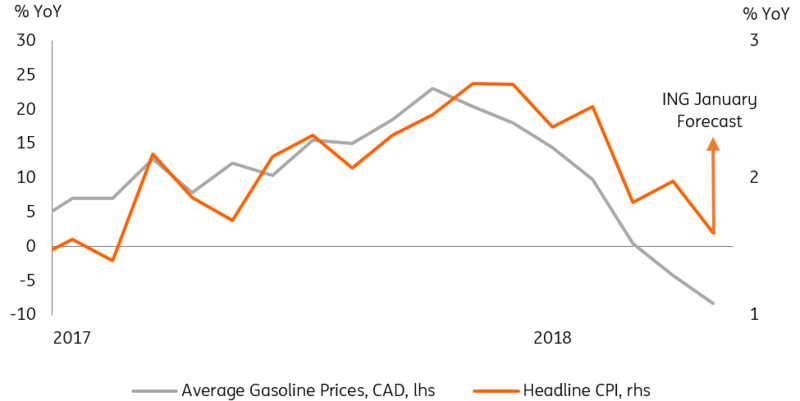 But if income gains are sustained as we expect, then this would help keep core inflation propped up around the Bank of Canada’s 2% inflation target. Read: Will the core cause concern? Given that core inflation component is a key part of the central bank’s hiking rationale, it supports our case that monetary tightening will resume later this year. That said, the Bank of Canada will also be keeping a keen eye on the severity of any housing market downturn, trade developments between the US and China, as well as oil prices. Nonetheless, economic fundamentals – such as a strong labour market and on/around-target core inflation, paint a positive picture. If these downside risks don’t materialise, we expect the central bank to hike once (if not twice) this year. The next move is most likely to come in the third quarter, allowing time to see how the Federal Reserve acts over the next few months.